If you find yourself stuck because you need to use EF 6 features in an ASP.NET Core web app with Identity, don’t worry, it is easy! Like many of you, I am trying to get all caught up with ASP.NET Core. It has some great features and I’ve been looking forward to using it. I finally have a new project to start so Core was my first choice.To expand on that a bit, I am using ASP.NET Core with the full .NET Framework. At this point, I don’t need to use .NET Core in cross platform scenarios. It wasn’t long after I got started that I ran into what I thought was a big problem.Spoiler Alert: It wasn’t a big problem at all! But it turns out that AddEntityFrameworkStores doesn’t exist in EF 6. This got me going on all kinds of research, trial and error. All for nothing. You see, I was going about this all wrong. Thanks to some help from Julie Lerman (Entity Framework Guru and fellow Microsoft MVP) and Diego Vega (from the EF team at Microsoft), I found out that I could in fact run EF 6 and EF Core in the same project! All I needed to do (after getting all of the EF Core nuget packages all loaded up again) was create 2 DbContexts! One with EF Core for the Identity stuff. And one with EF6 for my application logic (so I can use the spatial features including DbGeography). At first, I had a some namespace confusion because there are classes with the same names in EF 6 and Core. But that was easily resolved. It’s great when the solution is so simple. Posted in .Net, asp.net, C#, Entity Framework. 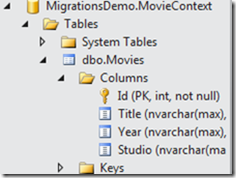 Entity Framework Code First Migrations: Where have you been all my life? It seems like for forever I have been dealing with the problem of deploying software and keeping the database updates synchronized at the same time. I’m sure you’ve been there too. 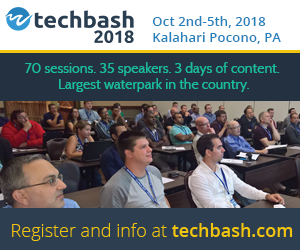 If you are developing software, you likely need database schema changes from time to time (or much more often). If you are running a local copy of the database for development (I like working like that), you can easily make the change on your local SQL Server instance (or some other database product). But then you need all of your teammates to update their database instances with the changes. Of course, they may have changes to the schema as well. All that, plus sooner or later you will need to deploy these changes to the test, staging or production database. Where I have worked we used a variety of techniques to accomplish this goal but it has never been easy. Finally, Microsoft gives us Entity Framework Migrations! This makes this situation very easy to deal with! Here are some steps to get started with Migrations. I was surprised with how easy this is to use. To be fair, I haven’t pushed this technology much past the basics but it is working quite nicely on my project so far. Also I’m using EF Code First which is really cool but in this post, I won’t be explaining all of the parts of that. I’ll mention the basic steps but if you want to learn more about the many features of EF Code First, you’ll need to look elsewhere. Beware, I am running Visual Studio 11 Beta, .Net 4.5 Beta, Entity Framework 5 Beta. You should be able to accomplish this stuff with earlier versions too. Create a new application. I’m working with a simple C# Console App. I did get an error when I did that. I don’t recall getting that error in the past but to resolve the error, I used the Add Reference Dialog and added a reference to System.ComponentModel.DataAnnotations. Then I re-tried the console command and it worked just fine. Next we’ll need to create an entity that needs to be in our database. In my application, I need a simple object to represent movies. You will note that I did NOT annotate this class with any attributes at all. Next we’ll need to create our DbContext. It too is pretty simple. Ok for this simple sample, my initial data schema is done. Since this is Code First however, my database doesn’t actually exist yet. Let’s have Entity Framework create it for us. To do so, we need to run our application. Before running it, just add this code to the Main method of your console app. If your application doesn’t “use” the DbContext, it won’t be generated. Yes, the Id was automatically turned into a primary key. Sweet, huh? Code First Rocks! When you enable migrations, it will create a Migrations folder in your project with two files. 201204190017084_InitialCreate.cs (your name will vary). This file contains the code to create your database schema from scratch. In this case, there is only one table. This will be important because after we do our next migration, we may need to roll back to our initial design. Configuration.cs which is used for… you guessed it, configuration of Migrations. One important setting is AutomaticMigrationsEnabled. With that set to true, EF will always migrate your database when you run your application and it detects that your context is out of sync with your db. Check out these files and you will see how simple this stuff is. Each migration contains an Up() method and a Down() method. This enables you to migrate your database up and down to any version! In this case, that is perfect and just what we expected. Next, this command in Package Manager Console: PM> update-database You’ll get some messages confirming the action. When I check my database I’ll see that the new column was added just as I needed. I can now run my application successfully again. Too bad my application doesn’t do anything. To create scripts instead of actually updating your database, you can use a command similar to this: update-database -Script -TargetMigration Genre These scripts can be saved and used as part of your deployment process. 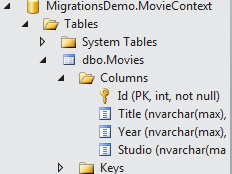 Those are the basics of Entity Framework Migrations. I think you will find it is pretty easy to use. For more information, I suggest you follow the ADO.Net Team Blog. Posted in .Net, C#, Entity Framework, SQL Server.